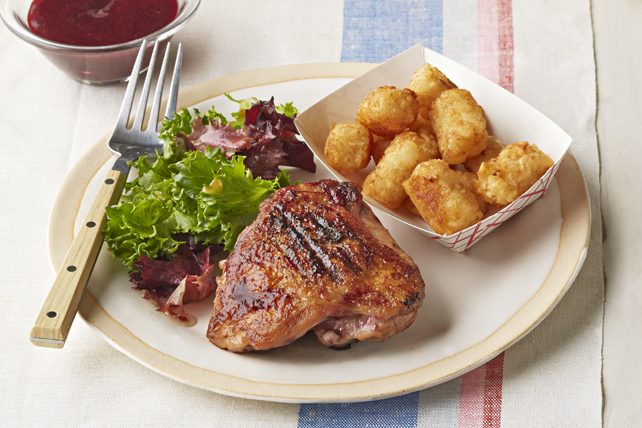 Fresh blackberries add a touch of sweet-tart to our barbecue sauce, which is used in this super chicken dinner. Blend blackberries in blender until smooth. Pour through fine-mesh strainer into medium bowl; discard strained seeds. Add barbecue sauce to strained berries; mix well. Reserve half the barbecue sauce mixture for later use. Grill chicken 8 to 10 min. on each side or until done (165ºF), brushing with remaining barbecue sauce mixture for the last 5 min. Meanwhile, spread potato nuggets into single layer on bottom of disposable shallow foil pan sprayed with cooking spray. Place on barbecue grate next to chicken. Grill 10 min. or until potato nuggets are heated through and golden brown, stirring occasionally. Toss salad greens with dressing. Serve with potato nuggets, chicken and reserved barbecue sauce mixture. Prepare using Bull's-Eye Sweet & Sticky Barbecue Sauce.